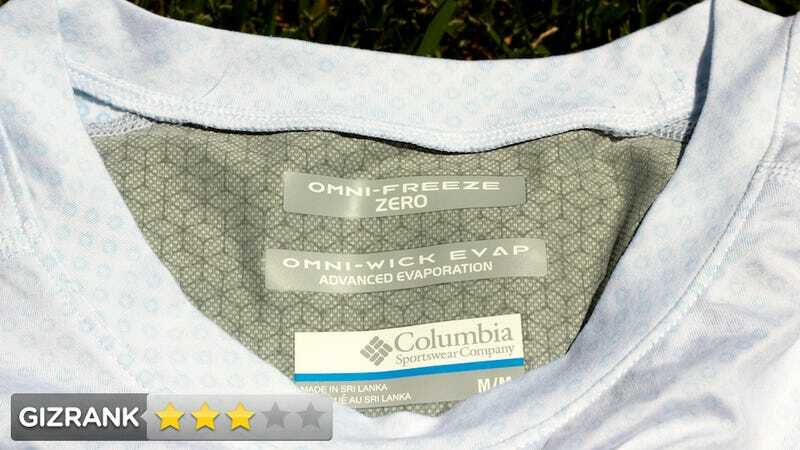 Columbia's Freeze Degree Short Sleeve Crew contains a fabric filled with polymers called Omni-Freeze. They act like goosebumps—to cool the skin, the tiny rings swell up when they get wet. Innuendo aside, this kind of works. A t-shirt that cools you down as you get hotter and sweatier. The fabric moves sweat away from moist areas, like the back and underarms. It has an antimicrobial treatment and UPF 50 sun protection. Anyone who wishes they were cooler than they currently are (temperature-wise). Slim but not tight. Covered in tiny blue circles. People said it looks futuristic—in a good way. One of Columbia's beta-testers said that wearing this thing felt cooler than running with a shirt off. Not true. But this is certainly better than running in a plain cotton t-shirt. The fabric is soft, slick, and stretchy, like a silk-spandex hybrid. It's comfy. A seam that chafes your shoulders feels like getting a back rub with dental floss. This shirt actually reduces sweating. But then, when the shirt isn't wet, there's no cooling effect. The cooling effect improves when there's a slight breeze. The medium size was a bit loose on a skinny frame. After four runs—25 miles—it started reeking noticeably. That's not as good as the greatest t-shirt in the world. No sunburns in California sunshine over 80 degrees. The Omni-Shade works. The wicking back panel evenly distributed sweat, but it didn't send moisture into the Omni-Freeze material. That would have been nice, considering the Omni-Freeze is where the cooling effect comes from. The cooling effect works pretty well, but it's not as effective as just going shirtless. A wearable air conditioner, this is not. If you're too modest to go barechested—or need extra protection from sunburn—the $60 shirt goes on sale next spring.